From 1 to 17 December 2016, UNU-IAS experts and staff participated in the UN Biodiversity Conference, consisting of the Thirteenth Conference of the Parties to the Convention on Biological Diversity (CBD COP 13) and a number of related conferences, meetings and events. The conference highlighted UNU-IAS work related to the International Satoyama Initiative (ISI) project, as well as projects on Education for Sustainable Development (ESD), biodiversity and human health, and others. UNU-IAS also contributed to a number of events and activities organized by partner organizations. 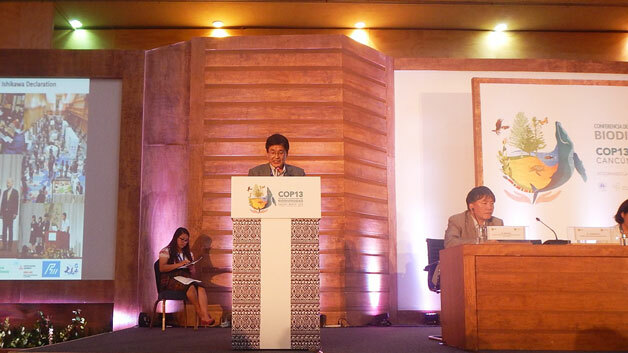 Kazuhiko Takeuchi made a statement in the opening plenary of CBD COP 13, highlighting UNU’s role in developing the Satoyama Initiative as a global effort sharing the vision of the UN Decade on Biodiversity 2011–2020 of “living in harmony with nature”, and various related UNU activities. He also focused attention on UNU’s work in exploring the links between biological and cultural diversity, particularly the recent First Asian Conference on Biocultural Diversity and its output document, the Ishikawa Declaration on Biocultural Diversity. UNU-IAS organized a number of side events in collaboration with partners, including Strategic Action for Mainstreaming Biodiversity: Contributions of the International Partnership for the Satoyama Initiative (IPSI) to Biodiversity and Human Well-Being on 6 December, featuring a keynote address by Prof. Takeuchi, and Contributions of Funding Mechanisms under the Satoyama Initiative to Mainstreaming Biodiversity for Well-being on 8 December. Other events focused on biodiversity and human health, and research related to the science of biodiversity and involvement in the Intergovernmental Platform on Biodiversity and Ecosystem Services (IPBES).